The UNICARD is an electronic ID card in credit card format issued by the University of Bern. It serves students as a student identity card and staff as a personal identity card. As well as serving as a student identity card, the UNICARD can also be used as a library card, means of payment or access badge. 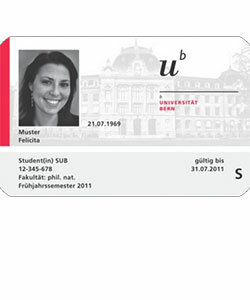 Dual role: for students who work at the University of Bern while studying, the UNICARD is both a student identity card and a staff identity card, i.e. as second card is not issued. The dual role is indicated in the validation area of the card. Both roles will also be indicated in the validation strip for dual student/lecturer roles.